Cities like Toronto are growing and changing so fast that we sometimes lose sight of how much history they have. Demolition, construction and other changes in the urban environment tend to make our memories of what preceded them fuzzy: more than once I’ve seen a new building go up on a familiar corner, and then a few years later been unable to recall exactly what stood there before. Luckily for urban amnesiacs like me, and anyone interested in the past underneath the pavement, there are a whole bunch of creative people blogging about Toronto’s history in photos. I really like Jeff Low’s Then and Now photo collection on the website Urban Toronto. Low puts up archival photos of intersections, buildings, and street scenes, followed by pictures showing what that specific place looks like today. It’s a great way to reflect not just on change, but also on continuities, in our cityscape. For continuity, witness Spadina and College, anchored by the El Mocambo both in 1969 and 2012. Or for change, check out Dundas at Yonge, pre- and post all of the movie screens and patio furniture. Alden Cudanin’s TOB4 Remixes do something similar, but with a little more artistic license. Cudanin takes old and new photos of iconic TO landmarks and corners – say, Yonge and King – and creates one image out of them (a mashup). New bursts in on old, or vice versa; it’s fascinating to see a 1913 shot of the Ward, Toronto’s most notorious slum, sharing space with the skating rink at Nathan Phillips Square (see it here). They look awesome, and you really get a sense of seeing a place with a deep past. Cudanin and Low are making historical images – mainly from public archives – more accessible, and providing a jumping off point for understanding how cities change. A plus of the online format is that it can facilitate discussion between visitors and contributors. A good place to see this on the Vintage Toronto facebook group, where Low and Cudanin’s stuff is posted regularly. The page gets loads of traffic: 32000 likes and 7000 shares since it was started in January. People often ask questions about posts or bring up their own memories of the places and events depicted; they are also encouraged to post their old photos. The images are often worth looking at, and you can learn something interesting from the comments. Post a flyer from a Frank Zappa show at Maple Leaf Gardens, date unknown, and soon enough someone who went to the show will see it, provide the date (1977), where they bought their tickets (Round Records on Yonge), or how much weed cost back then (cheap). So in addition to providing a forum for archive hounds like Low and Cudanin, Vintage Toronto is creating an archive of previously unknown images, and crowd-sourcing the cataloguing. Recently I tried to do a mashup of my own – kind of a low-tech tribute to Cudanin – and found out that it’s harder than it looks. 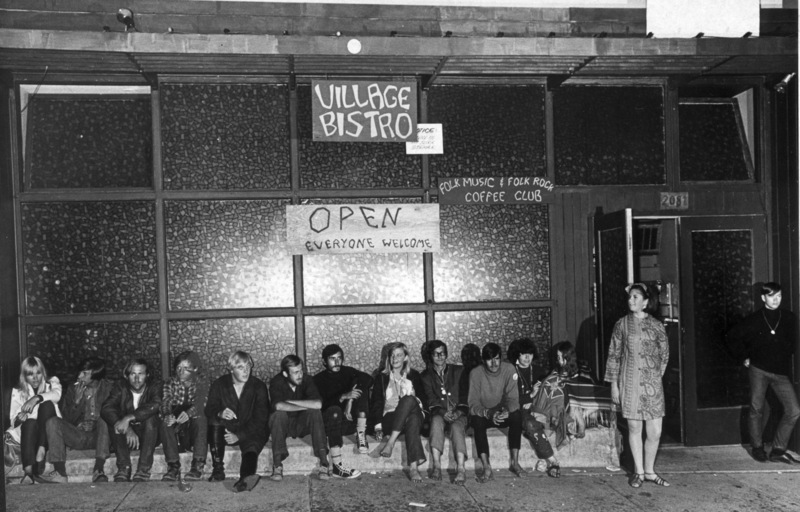 I came across a great picture in the Vancouver Sun (July 1967) of a bunch of young people hanging out in the heart of Vancouver’s hippie-dom, West 4th Ave. I love the style, the bare feet, the sign on the café, the whole scene. I also enjoy seeing how almost everyone is studiously ignoring the photographer, despite the fact that he seems to be shining his headlights right in their eyes (an old deer-hunting trick?). Using the site HistoryPin, I stuck my photo to a map of Vancouver, and embedded it in Google Streetview as well. The hippest spot on 4th Ave. (and up there for the city of Vancouver as a whole) in the Summer of Love is now a hair salon. Which makes sense, considering how 4th Ave. has evolved over the past four decades, from a somewhat run-down strip – the low rents attracted hip businesses like the Village Bistro – to an upscale shopping and dining destination. I’m not the only historian getting into this. NiCHE had a photo mashup contest this summer, and there were some great entries. Somehow I managed to come in 2nd. While I don’t see artistic success in my future, I do think this would be a great project for an undergraduate history class. Pedagogically it has a lot going for it: it’s fun to do, it uses technology in a creative way, and it brings up some interesting questions about using photographs as sources (what do they capture, what do they leave out? ), about nostalgia, and about how we represent historical change. Mash it up! This entry was posted on October 1, 2012 by Daniel in awards, public history and tagged history blog, photo mashup, Toronto.